The sun angle in Seattle today is exactly the same as it was in Kauai when we were there in February. And we were golden brown when we left Hawaii. Arlington forecast is wrong... particularly for Sunday. It will probably be completely sunny up here that day. 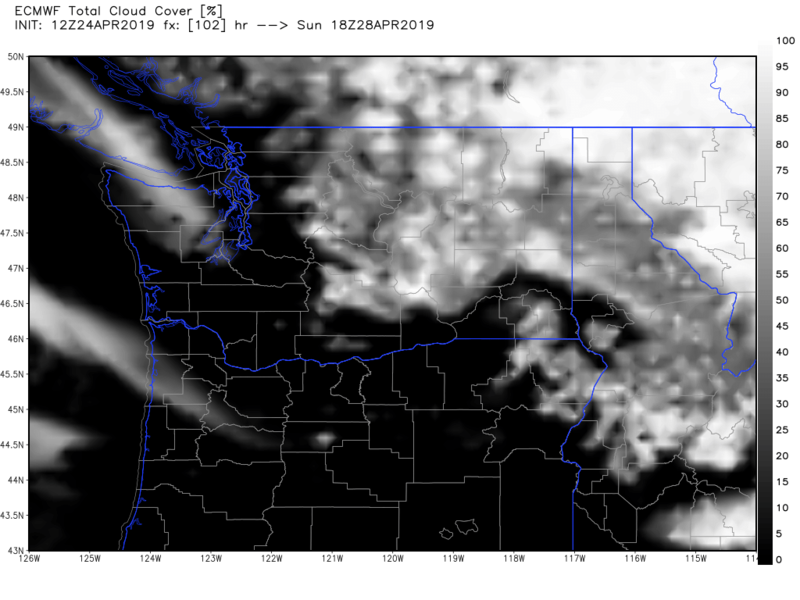 Clear sunny day for the most part after 1pm. Sun made it feel a little warmer but overall not super warm only about 57 degrees for the high tempature. Second half of April is starting to turn out pretty nice overall. Glad there's not a heatwave coming up. Bizarre lack of EPS maps lately..
EPS has been pretty much in line with the ECMWF operational runs lately. Not much to say. ECMWF operational runs have looked troughy for the next 10 days and yet most days are shown to be partly to mostly sunny and in the 60s. Perfect spring weather. Very little rain for the next 10 days. EPS has looked the same. Maybe a hint of a jet extension in 15 days but it has been pushed back for each of the last 5 or 6 runs. I am sure it will happen eventually though. EPS has been pretty much like the ECMWF operational runs lately. Not much to say. That hasn’t stopped you in the past. Back in March you were posting the D10-15 EPS maps twice a day when they were in full agreement with the (ridgy) operational run. 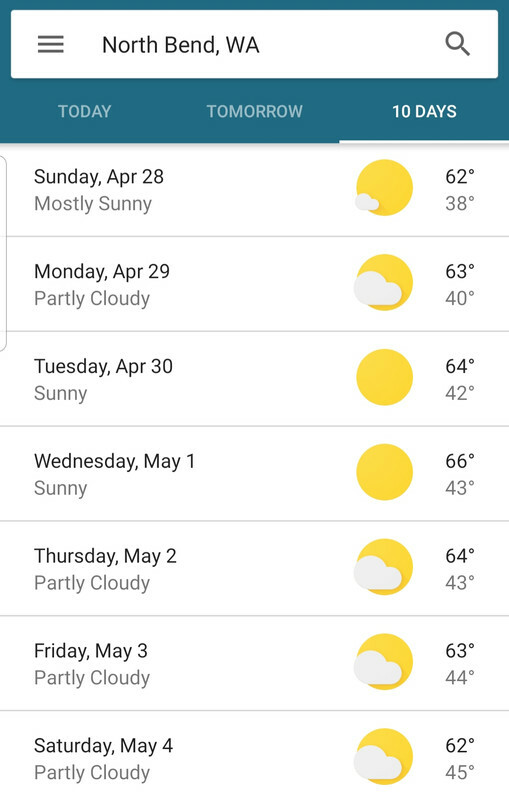 I am very pleased with the upcoming weather as it looks now... so I am not withholding maps because I am not happy if that is your implication. 10-15 day period will probably be warmer... maybe a little wetter but its been consistently pushed back to day 15 for several runs so not locked in yet. No change on the 00Z ECMWF... except the the last couple days of the run are much warmer than the 12Z run. Almost no rain for the next 10 days despite a troughy pattern overall. Lots of sunshine as well. It actually shows no rain at all for Portland and about .01 for Seattle total over the next 10 days. Maybe .10 out here and that is primarily focused on Saturday morning. Another frosty morning, glad I didn't put the ice scraper away! 45 at SEA... 40 here... and 35 in the valley. Would be nice to avoid frost until October now. I'll probably see frost on Sunday or Monday morning. 36 for a low and had light frost on the grass. 46 currently high clouds filtering out the blue skies however. Was a nice day yesterday overall. Second half of the month has turned around for the better. Seemed like just a few days ago we were talking about it being 45 and rainy for this upcoming weekend potentially. Hopefully in May we atleast get a couple of days of rain to atleast meet average rainfall for the month. Things have sure turned dry though. No signs of meaningful rain for the next two weeks. No complaints from me... after probably a foot of rain here this month. Not really worried about a lack of rain. Cedar Lake is at 13 inches of rain for the month (normal is 8.2 inches). Now into the top 10 wettest Aprils for that station since 1898. I think we can enjoy a little nice weather now without being told it has to rain every day (that is not climo). 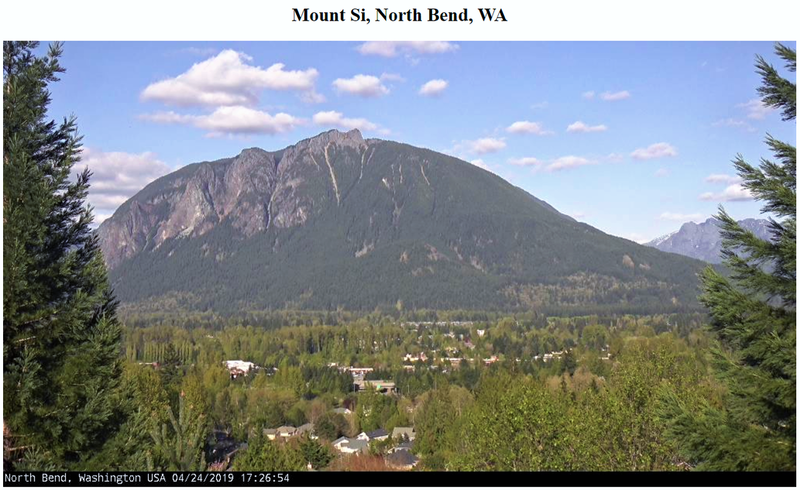 This is the North Bend weather forum. My son was sitting out on the deck yesterday without a shirt and asked me if he would get tan now... so I looked up the sun angle and compared it to Hawaii in February when I know we all got tan. It was literally exactly the same yesterday here as the day we arrived in Hawaii. Looks like near average rainfall for April. Pretty concerning seeing May turn bone dry again, like last year (although at least it isn’t looking as hot...yet). Hopefully we see another meaningfully wet pattern or two before summer. I am fairly certain there will be a couple more rainy periods in May and June this year given how streaky its been. OLM is running 10" below normal precip since 10/1, and 7" below normal for 2019. April will also end up below normal. Could end up being a drier than normal year. Drier than normal out here as well for the rainy season (since 10/1). Oct - Dec was almost perfectly normal... but Jan - Mar was drier than normal. Although winter rain does not seem to be as important as the overall pattern during the warm season in terms fires and vegetation. Everything looks really green since about 4-5 weeks ago once the temperatures got up into the 60s here after the snow early in March things really greened up. April was Wet here not a soaker like it was in the foothills but enough to catch things up a bit and make the grass grow. I think we’re due for a streak of dry weather coming up. Hopefully it isn’t too dry in May and June. Everything would have really greened up in April regardless of how much rain fell. Days of chilly rain seems to put everything on pause. Warm weather is what accelerates the greening up process. I was looking back at pics from April 2016 which waa dry and warm and everything was in overdrive... it looked like summer here by the middle of the month. A really wet and cold spring like 2011 was the opposite... everything was really slowed down. Maybe in April. On the flip side I remember everything looking lush and green from May well into late July that year. This was mid April in 2016... one of the warmest and driest Aprils in history here. That did not prevent things from greening up fast. Well like I said it greened up after we had the warm stretch in mid to late March. Rains happened after things had already became really green in mid march. Obviously warm sunny days play a big role which is why it became green last month. Rain does help out with the grass it has here where I live definitely. It was lush green into July in 2016 around here as well. 2015 was the opposite... it was turning brown by May.